IT'S MARCH MADNESS: This Year's Madness Could Cost $1.9B | Challenger, Gray & Christmas, Inc. It is estimated that more than 60 million Americans fill out tournament brackets. Many of these individuals, including the President of the United States, take time out of their workday to complete these brackets, as well as conduct the research needed to make informed selections. It is an annual tradition that has become woven into the fabric the American workplace and society at large. However, there is a cost in terms of lost wages paid to distracted and unproductive workers, and, this year, the cost could reach as high as $1.9 billion, according to calculations by global outplacement firm Challenger, Gray & Christmas, Inc.
“That figure may be on the conservative side, considering this year could garner a lot more interest from even casual basketball fans eager to see if Kentucky can continue its undefeated season through the tournament,” said John A. Challenger, chief executive officer of Challenger, Gray & Christmas. “If Kentucky plays their first tournament game during the workday, it wouldn’t be shocking if every single working person in the state called in sick for the day or took an extra-long lunch break,” Challenger joked. Challenger’s estimate is based on the number of working Americans who are likely to be caught up in March Madness; the estimated time spent filling out brackets and streaming games; and average hourly earnings, which, in January, stood at $24.78, according to the Bureau of Labor Statistics. The challenge is estimating the number of people who participate in March Madness pools. A 2009 Microsoft survey, estimated that 50 million Americans participate in March Madness office pools. A 2014 article at Smithsonian.com put the number of Americans “filling out brackets” at 60 million. Meanwhile, a 2012 MSN survey found that 86 percent of workers will devote at least part of their workday to updating brackets, checking scores and following games during the tournament. If that survey sample was representative of the US workforce, it means that the number the working Americans with “March Madness” could reach 119 million. Even with the most conservative estimates, March Madness is still costly. A 2013 survey by CareerBuilder.com found that 19 percent of private sector workers participated in March Madness office pools. Based on the latest private-sector payroll data from the Bureau of Labor Statistics, the 19 percent represents about 22.3 million workers. Each hour of unproductive work time for these 22.3 million March Madness pool participants costs the nation’s employers $552.6 million. “Of course, the 22.3 million figure leaves out public-sector workers. However, they too get caught up in March Madness. In fact, the most powerful public-sector worker in the country – President Obama – has filled out a bracket each year he’s been in office,” said Challenger. “While some might argue that measuring productivity for salaried workers, including the president, is very difficult. After all, these workers are not confined to a 9-to-5 workday. So, if a little time during the workday is spent filling out a bracket, that work will be made up at another time. “However, it is important to remember that hourly-wage earners number 77.2 million, representing more than 52 percent all workers. And, it is not just low-skilled minimum wage earners who are clock punchers. Many professionals, the most notable being attorneys, charge for their services on an hourly basis,” Challenger noted. “Additionally, while it may have once been true that only deskbound office workers with internet access were at risk of being distracted by the tournament, now anyone with a mobile phone can get in on the action. Armed with ubiquitous tablets and smart phones, even hourly workers in the field may be consumed by the tournament,” said Challenger. So, employers should ban workplace pools and block access to streaming sites, right? “This tournament and the betting and bracket-building that come with it are ingrained in the national fabric. Trying to stop it would be like trying to stop a freight train. 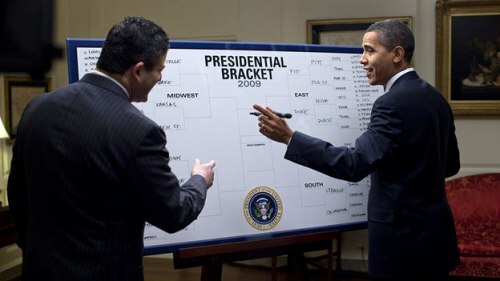 When even the president finds time to fill out a bracket, an employer would be hard pressed to come up with a legitimate reason to clamp down on March Madness activities,” said Challenger. “Any attempt to do so would most likely result in long-term damage to employee morale, loyalty and engagement that would far outweigh any short-term benefit to productivity. “If anything, employers should embrace March Madness and seek ways to it as a tool to boost employee morale and engagement. For example, creating a company-wide office pool that is free to enter and offers a free lunch or gift card for the winner could help build camaraderie and encourage interaction among co-workers who may not typically cross paths,” he concluded. 60,000,000	Estimated number of Americans who “fill out a bracket each year,” according to March 2014 article on Smithsonian.com. 22,000,000	Number of private sector workers who participated in MM office pool, based on 1-in-5 (19%) respondents to a November 2013 CareerBuilder.com survey. Applied to the BLS count on private, nonfarm payroll employees of 116.3 million (116.3 mil X .19 = 22 million). 11,000,000	Approximate number of people filling out brackets on ESPN.com during 2014 Tournament. 16.3 million	Gross total of viewers of Turner Sports’ coverage of semifinal rounds on TBS, TNT, and TruTV in 2014. 21 million	Number of viewers for CBS coverage of 2014 NCAA national championship. 102 million	Total number of unique viewers for entire 2014 tournament. 9.9 million	Number of unique viewers who streamed games on NCAA March Madness Live in 2014. 86% Percentage of respondents to 2012 MSN survey who said they will devote at least part of their workday to updating brackets, checking scores and following games during the tournament. If that holds this year, more than 119 million workers will be distracted by March Madness. (.86 X 138,728,000, which was total nonfarm employment in January, according to BLS).